"Having gone through this hell myself, Mike and Jim do a superb job with pictures and personal accounts taking you through the costliest Natural Disaster in US History"
Orders will be shipped out within 24 hours of purchase. 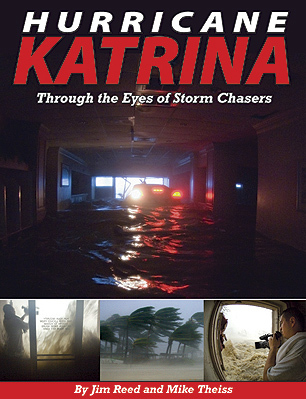 Hurricane Katrina: Through the Eyes of Storm Chasers offers a historic and unprecedented view inside a Category 5 hurricane—and of the devastating aftermath. Award-winning extreme-weather photographer Jim Reed and storm-chaser/videographer Mike Theiss document the most destructive natural disaster in U.S. history at every stage, from the days in which the Gulf Coast prepared for the approaching hurricane and evacuation procedures began to the moments when the hurricane made it's monstrous landfall and wrecked havoc the region. The work of these two professional storm chasers is in much demand, and the pair have shared their Hurricane Katrina photographs and experiences on the Today Show, MSNBC, CNBC, and CNN. The compilation includes photographs of Louisiana, including New Orleans, Mississippi, Alabama, and Florida. Chilling "before and after” images demonstrate the power of this historic hurricane. Captions detailing personal stories and weather facts accompany the shocking images.